Teaching statistics is hard. For one thing, stats activities often take a long time to do. Also, for any grade level, the relevant stats activities are often a combination of different math activities. Even something simple, like building a line plot of a simple bell curve, can consist of making dozens of measurements and plotting them all as points over a number line. Just one stats activity can be the same amount of work as an entire math worksheet! How can we best utilize the amount of time teachers and students have in the classroom for interactive stats activities? 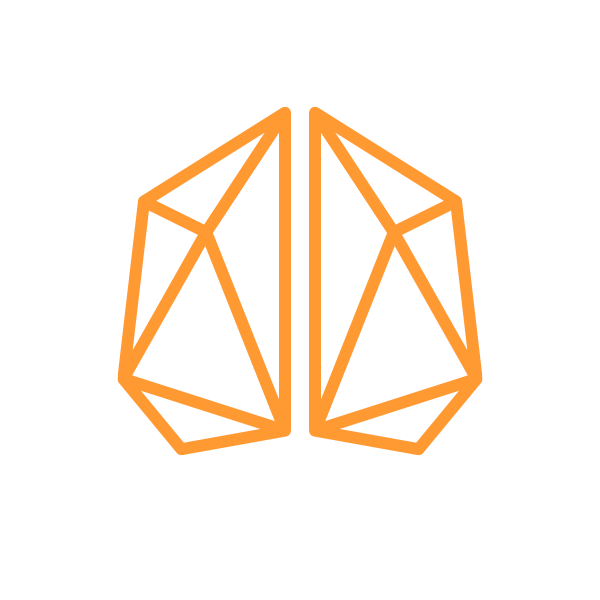 As a game designer at MIND Research Institute, I was excited to answer this question. I have spent the past year applying game mechanics to statistics in a way that ensures students could build line plots and receive informative feedback much faster than in a traditional classroom activity. In this example, I asked ten of my colleagues how many pets they had. As you can see, I didn’t count fish (because you can’t cuddle a fish, or at least you shouldn't). At the extremes, you can see that three people had no pets, and one person had eleven pets (which frankly explains a lot about him). This kind of thing is exactly what second graders are expected to do. Eventually, this will lead to all the usual suspects for stats—normal distributions, standard deviations, and the like. For second graders, though, we are asking a lot of students. The number line is a new concept, and in this example the number line needs to have ten different measurements plotted accurately above it. 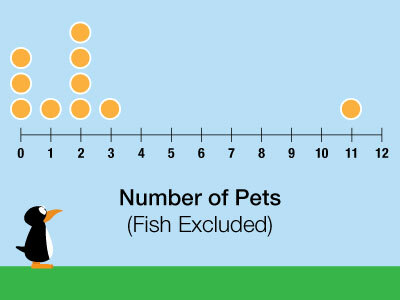 The “number of pets” survey is a great introduction to dot plots. After students create their line plots, the teacher could lead a discussion with questions like “What is the most common number of pets?” and “What is the most pets that anyone has?” These questions map nicely onto the concepts of mode and maximum. The main downside to this activity is that it is missing a rigorous sense of measurement. Students at this stage should be making a strong connection between line plots, the number line, and rulers. In the survey, however, students are simply declaring numbers, possibly made up. Is Joey counting his iguanas as one pet instead of two? Is Natalia counting her imaginary unicorns? The measurement rigor is missing from this activity. For another idea, let’s turn to one of my favorite resources for early statistics education, the “Guidelines for Assessment and Instruction in Statistics Education” (GAISE) PreK-12 Report by the American Statistical Association. The GAISE Report suggests on page 31 (recommended reading, really!) that each student measure his or her arm length, and then the class makes a plot of all the lengths. The Common Core standard supports the use of rulers in this way, and the measurements could also include fractions for the slightly older students. It’s still missing something, though: meaningful context. Meaningful context is the holy grail of any classroom lesson, to be sure, but statistics has an unusually high potential to actually achieve it. Who cares how long our arms are? And let’s not forget that having a noteworthy arm length could be a pretty embarrassing thing in the second grade (I for one wouldn’t have appreciated my second grade “monkey arms” being used as an example of an outlier in a stats lesson). What can students measure that they actually care about? It needs to be something that represents a real effort, something that the student was trying to do. If enough students were trying to do something that could be measured, a teacher could make it into a line plot and observe the variability across students. With this in mind, when our team got together to start building the brand new statistics games for the 2016 version of ST Math, I kicked it off with a line plot-building exercise. It could just as easily work outdoors at a school. 1. Set a jump rope on the grass to represent the goal line, and about 15 feet from it, set a bucket of golf-sized wiffle balls. 2. Mark distances from the batting spot (0 feet) to the jump rope (15 feet), and a bit beyond the jump rope (20 feet). 3. Split into two teams. A player on each team is designated as the pitcher, pitching wiffle balls to team members who use a racquet to try to hit the balls as close as possible to the jump rope. 4. After everyone has batted, measure the location of each ball for each team. 5. Back in the classroom, record the raw data on the whiteboard. As a class, create two different line plots, one for each team. Creating two line plots allows for a great opportunity to compare and discuss as a class. Maybe start by asking "Who won?" It’s an easy question to ask, but not so simple to answer. Depending on the age of the group, it could lead to great conversations about mean vs median. Even for early grades, the mode could be used to discuss the “most common” distance. Depending on the age group, another great question is, “Who was more consistent?”, which in sixth grade can motivate boxplots and interquartile range (and mean absolute deviation, if you’re bold enough). 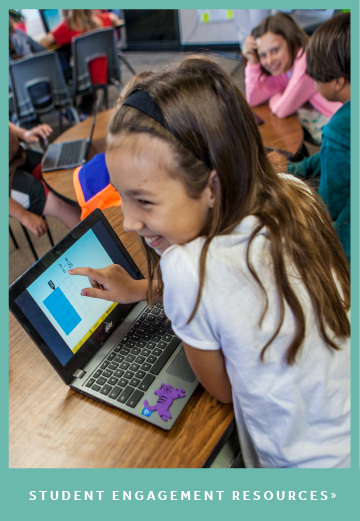 It was exciting for me, as an ST Math game designer, to explore the possibilities for bringing line plots into ST Math for the first time, and using technology to amplify what students can learn during interactive statistics activities. These all-class group activities are engaging, but they take a long time. Organizing a game like the one I’ve described requires about an hour to implement. In the same amount of time used by that group activity, students can make many line plots in ST Math. Similarly, class activities are great introductions, but even the most diligent teacher can’t possibly provide real-time feedback for every student as they all make line plots. But this is what ST Math does well, by giving just-in-time feedback for every student in the class. Not familiar with ST Math? Learn more and play the demo. You see, one of the things that makes ST Math so effective is its relentless focus on education. 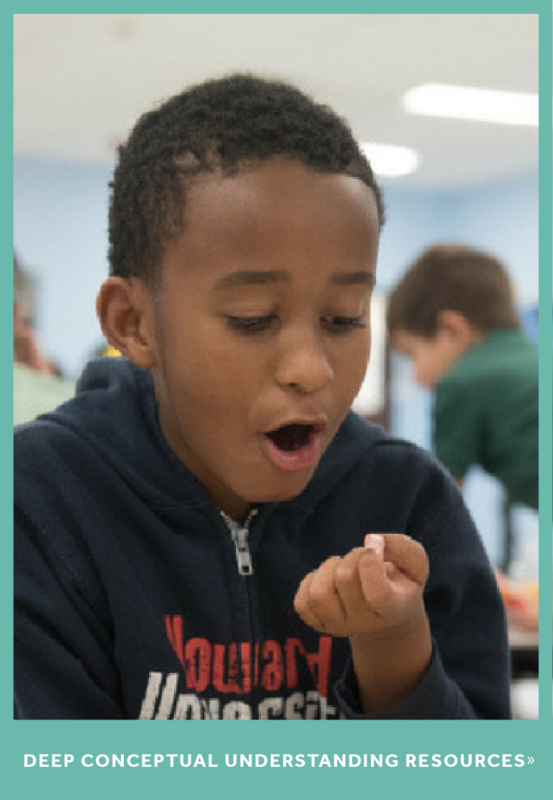 The game rewards students based on what they’ve learned, and never on non-essential game elements that could distract students from the learning. So here’s what we tried: if JiJi’s friend Red Panda kicks the ball to the goal, a creature pops out of the ground underneath it. If Red Panda kicks the ball that same distance again, a different creature pops out. If Red Panda misses the goal, nothing bad happens at all. Goal or no goal, the student still builds the line plot, and the game progresses based on the accuracy of the line plot, and never based on the kicking accuracy. Researcher: “OK, how do you know that? How do you know you kicked it four times? This is exactly the kind of response we would hope for from a second grader. She was able to answer questions about an event by referencing the line plot that she made, and even demonstrated a solid understanding of zero as a measurement. Which line plot is more spread out? How much more spread out is it? What does that mean in soccer? One last tip: if you want to see a student’s line plot that he or she built in a previous level of ST Math, you can simply ask the student to re-open that level. The old line plot will still be there! This allows you to facilitate follow-up questions with individual students, referring to data that they generated, measured, and recorded all by themselves. This kind of individual ownership of the data is one of the many things that makes ST Math such an excellent addition to any existing statistics curriculum. And it’s why I love designing games like this!